The new X-LAS MkII Scintillometer provides continuous measurements of sensible heat fluxes over path lengths from 1 km up to 12 km. The measurement process is very straight forward and yields fast results. Since limited power is required, in most cases a simple solar-charged battery is sufficient. The X-LAS MkII receiver has internal digital processing unit automatically computes all relevant parameters, such as Cn2 and the sensible heat flux. Real-time data is available on the display so you will know the status of your experiment in seconds. The built-in data logger stores several months of measurements and results. A digital interface allows remote real-time display and full control over the instrument operational settings. Analogue outputs are also available enabling connection of the instrument to virtually any data acquisition system. This allows for easy integration into new or existing measurement networks. Carrying instruments around for field deployment is already labour intensive enough, without having to think about laptops, interface cables and software. The X-LAS MkII can be installed and configured using its built-in display and key-pad without the need for any extra equipment, and features a carbon fibre housing for easier transport. The carbon fibre also ensures a very stiff and temperature stable enclosure for the optics, ensuring accurate, long term data. The scintillometer on its own measures changes in refractive index of the atmosphere, Cn2, but with the optional meteorological sensor kit it can calculate sensible heat flux. This kit consists of wind speed, temperature and pressure sensors and plugs directly into the X-LAS MkII receiver. The EVATION® software suite is included as standard to view real-time data numerically and graphically and provides advanced data post-processing. Data processing Internal processing of Cn2, sensible heat flux and other parameters. Built-in data logger. GPS time. I have an older version of the LAS150 or XLAS300. Can I use the latest Evation to process my data into fluxes? Yes you can, but there are a few points you have to take care with as the analogue data output has changed in format. See appendix H of the latest manual, for details of the conversion of the analogue voltage output, UCn2. Note, the manual is written for the improved LAS MkII with GPS, so there will be differences in the hardware, and there are a couple of data formatting issues that are different (voltage ranges). Most likely the format of your UCn2 data is incorrect for the latest version of Evation, as the software was developed to work with the LAS MkII, which has a different analogue voltage output (positive instead of negative). Can a LAS MkII be used to measure crosswind? Yes, this is possible by logging the analogue output with a fast (500 Hz) data logger, and looking at the shift in the peak of the scintillation spectrum (the scintillation power spectrum shifts linearly along the frequency domain as a function of the crosswind). In the optical microwave sintillometer, the raw data is already logged at 500Hz, so this could be implimented. Built-in data processing to calculate the crosswind may be added in the future. See the following publication for more information: van Dinther, D., O. K. Hartogensis, and A. F. Moene, 2013: Crosswinds from a single-aperture scintillometer using spectral techniques. J. Atmos. Oceanic Technol., 30, 3–21. I am leaving my LAS unattended in the field for a period, how should I secure it? For a long term installation, stable steel constructions such as a steel frame or post, on a concrete foundation, are recommended to avoid vibration or miss-alignment. If tripods are used for field work, they should be fixed or tied to the ground when left unattended for a period to avoid damage from storms nocking the tripod over. To do this a ground anchor can be screwed into the ground under the tripod, and the tripod tied to this using a ratchet or cargo strap. Insure the tripod feet are firmly pushed into the ground first. If there are animals in the area protect the equipment from being pushed over, disturbed, or the cables chewed, by surrounding the installation with electric fencing. How often do I have to check the alignment of the LAS? How frequent the alignment has to be checked is dependent on the installation set-up. Tripods fixed in the ground can have the tendency to move, in particularly as the soil can become soft after periods of rain. In that case the alignment has to be checked at a regular interval. Once steel constructions are used on top of buildings, or tripods on a concrete foundation, the setup is much more stable and has to be checked less frequently. In-case one has the ability to check the data in real-time, the demod signal can help to monitor the alignment. A slow decreasing trend of the demod signal can suggest possible changes in the optical alignment (ignoring degradation of the LED). Can I measure latent heat flux, such as the evaporation from lakes or rice paddies directly? To measure both evaporation / latent heat flux and sensible heat flux directly (and without the restrictions when using a LAS on it own), a combined optical and microwave scintillometer can be used. This system measures both CT2, Cq2, and the co-variant term, CTq, between them, so no assumptions are made. Along with meteorological data from the receivers side mounted weather station, latent heat and sensible heat fluxes are calculated internally. See the Optical Microwave Scintillometer system page for more details. Can the LAS be used to measure evaporation of lakes? This has been done, see publication by: McJannet, D. L., F. J. Cook, R. P. McGloin, H. A. McGowan, and S. Burn (2011), Estimation of evaporation and sensible heat flux from open water using a large‐aperture scintillometer, Water Resour. Res., 47, W05545, doi: 10.1029/2010WR010155. In general the sensible heat flux (H) is small over lakes compared to the evaporation. As a result the derivation of CT2 from Cn2 becomes sensitive to fluctuations that are the produced by turbulent humidity fluctuations instead of temperature fluctuations. This correction can be expressed as a function of the Bowen-ratio ( ). The smaller the Bowen-ratio the larger the correction. Over water bodies evaporation is (in most cases) dominant over H, resulting in small Bowen-ratio values. It is advised to have accurate Bowen-ratio data. Typical diurnal course of H over land shows positive values during the day and (small) negative values at night. In this way it is relative easy to select either the unstable or stable solution when processing fluxes (in the Evation software) as the LAS itself cannot see the sign of the flux (and thus stability). Properties of water, such as the ability to store heat (i.e. heat capacity) are very different from land. As a result it is more complicated to predict the diurnal (seasonal) cycle of H. Instead it is advised to measure the gradient of temperature over water in order to determine the sign of H.
For the derivation of the sensible heat flux from CT2, the wind speed and surface roughness are required. As the surface roughness of open water bodies is dependant of the wave height (and thus wind speed) the standard applied flux-profile relationships cannot be used. Instead air-sea relationships have to be considered. To derive the evaporation from the LAS measurements (i.e. H) the soil heat flux term has to be known, i.e. the amount of heat stored in the ground or in this case stored in the water (G). For land surfaces so-called heat flux plates can be used to measure G. For water bodies this term is very difficult to determine. I want to derive fluxes from the LAS data, what kind of additional meteorological data do I need? Soil heat flux (preferably measured as closely to the soil surface as possible). In additional the gravitational acceleration, surface roughness and sensor heights are required. It is recommended to have the additional data at the same measurement interval as the LAS data. For land surface the typical diurnal course of H shows positive values during the day and negative values at night. Explanation: during (sunny) daytime conditions (roughly between sun rise and sun set) the earth’s surface heats up the atmosphere from below. This means H is pointed upward and defined positive. This situation is known as the unstable period. At night (roughly between sun set and sun rise) the surface cools due to long wave radiative cooling. As a result heat from the atmosphere is transported downwards to the surface. Hence, H is negative. This situation is defined as the stable period. The LAS is able to measure the magnitude of the sensible heat flux (H) but not the sign, i.e. is H directed upward (> 0) or downward (< 0)? Net radiation: During most situations when the net radiation is positive, the atmosphere is unstable. Once the net radiation becomes negative the atmosphere becomes stable. Note that this option is not applicable over intensively irrigated fields. Global/solar radiation: Although less accurate than net radiation data, but still useable. When the global radiation is higher than approximately 20 Wm-2, the atmosphere is unstable. When it drops below 20 Wm-2, assume stable conditions. The exact values are site/surface dependant. Temperature profile data: for example air temperature data collected at 0.25m and 3m height. During daytime close to the surface (0.25m) it is warmer than higher up in the atmosphere (3m), i.e. unstable conditions (dT/dz < 0). At night the situation is opposite, cold close to the surface and warm at higher levels, the condition is stable (dT/dz >0). This method is the most reliable one, but requires accurate temperature measurements. Cn2 data: During clear sunny days the Cn2-signal shows a very distinctive behaviour. Every time the atmosphere changes transition, the Cn2-signal drops to a very small value (® 1e-17). By determining the exact time when this occurs, the average time periods of unstable and stable conditions can be simply determined. During cloudy conditions the exact transition times are difficult to detect and is therefore difficult to automate. Is the LAS sensitive to tower vibrations? The measurement principle of the LAS is based on the scattering of EM radiation by the turbulent atmosphere that result in fluctuations of the intensity of light. The turbulent eddies that produce these scintillations have a size of the order of the aperture diameter of the LAS (or XLAS). 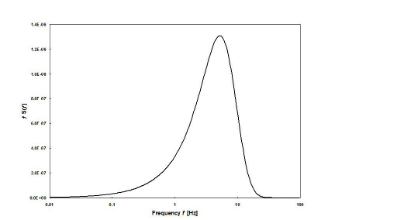 The figure below shows that in general these fluctuations lie mostly between 1 and 10 Hz (exact positing of the curve with respect to the x-axis is slightly dependant on the crosswind). The bandwidth of the LAS electronics is set around these fluctuations (0.1 Hz to 400 Hz). In this way electronic noise (> 400 Hz) and low frequency fluctuations related to absorption by the atmosphere (< 0.1 Hz) are removed. Figure 1: Theoretical spectrum of a 0.15 m LAS (path length = 1 km, wind speed = 1.5 m/s). Any type of fluctuations, e.g. caused by tower vibrations that lie within this bandwidth, in particular the ones that lie between 0.5 to 10 Hz can have significant effects on the measurements. It is therefore, strongly recommended to use stable and robust mounting platforms for the LAS units. How precisely do I have to measure the path length of the LAS? An error in the path length L of 1% results in an error of 3% in Cn2 (and thus H). This shows that the path length should be determined accurately. The effective height or height of the LAS beam should be measured to 1 cm (a tape measure can be used for this). What are the advantages of the Kipp & Zonen LAS MkII? The LAS MkII Large Aperture Scintillometer provides continuous measurements over path lengths from 100 m up to 4.5 km. It is the only scintillometer currently available with a built-in display and control-pad. It has internal digital processing to make calculations in-situ and to store data and results. Measurements are on a comparable scale to the pixel size of satellite instruments, making LAS MkII ideal for ground-truthing applications. The LAS MkII is convenient to use due to low power consumption, integrated data logger, accurate reference time from GPS, and works reliably in cold environments. Low power consumption due to the use of single LED and good collimation of the beam so little light is thrown away. This makes it practical for use with solar panel / battery electrical supply in field applications. Contains an integrated lens heater to avoid freezing of the instrument or condensation on the window, and provides good data in cold environments. More compact design with integrated datalogger, display and setup buttons which allows the configuration of the LAS without the need of an additional computer and cables / power supplies, and nothing needs to be taken apart. This makes transport and installation much easier. Direct connection of the meteorological sensor kit to the receiver instead of to a separate interface or data logger. Operates over the full data range of Cn2 of 1x10-17 to 1x10-11 (= 6 orders of magnitude). The transmitter (as well as the receiver) can be tilted to align for optimum signal gain, and minimal power usage. A supplied GPS antenna, mounted on the receiver, results in very accurate time from the satellites of the Global Positioning System, logged with the measured data. The complete LAS MkII system is shipped in one rugged aluminium transport case, which can be used in the field to store equipment if needed as the case is waterproof. Lined with custom fitted foam, it protects the LAS instrument from repeated shocks of 10 to 20g without losing calibration or alignment. A certificate is supplied with each instrument detailing a calibration against a reference instrument, performed outdoors for 2 weeks at the factory. A large aperture scintillometer (LAS) has less saturation problems compared to a laser scintillometer, or one with a smaller beam diameter, and so can be used over longer distances. What are the advantages of the LAS Method? No structure / tower influence on measurements (spatial weighting function / no flow distortion by instrument). A tower, building or valley sides can be used to gain height, and they (the support structure) has no or little effect on the measurements as the LAS responds more strongly to the middle of the path and not at all at the ends. Easy installation - Can measure over terrain which is difficult to access, or which you do not want to disturb. Does not disturb the measurements and measurement area (such as a protected wildlife area). What applications can scintillometry be used for? How do I connect an (X)LAS MkI to a CR10x or CR1000 data logger? The LAS and X-LAS scintillometer can be connected to the CR10x and CR1000 data loggers from Campbell Scientific. A (X)LAS scintillometer can be connected to a Campbell CR10x data logger using a 2:1 voltage divider like VDIV2.1 from Campbell. The reason for this is the fact that the LAS has an output of 0..-5V and the standard input range of the CR10x is ± 2.5V. Upload the example CR10x configuration file (or your own) to the data logger. Please note that this will erase pre-existing data! The example configuration file can be downloaded here: LAS_CR10x.CSI. Collect data using the data logger and check for normal operation of the Scintillometer data collection. The connection procedure for the CR1000 is similar to the CR10x. The same connection to the terminals for differential measurement of the LAS signals can be used. However, the input range of this data logger is ± 5V so a voltage divider is not required. How does WINLAS correct for an incorrect potentiometer setting? In case the path length has been set incorrectly during the installation of an LAS scintillometer, WINLAS can correct the Cn2 data. In order to do so please use the following procedure. After entering the relevant info in the parameters section, enter the path length setting set with the potentiometer of the LAS receiver in meters and enter the correct path length in the input field below. Select ‘Run…’ in the WINLAS file menu. WINLAS will now process the Scintillometer Cn2 data using a correction algorithm for the actual path length. Using the following equation to derive the intensity fluctuation data from the recorded Cn2 values calculated by the LAS using the incorrect path length setting. How do I determine the height of the LAS? To derive fluxes of sensible heat (H) from the LAS measurements (Cn2), one needs to know the height of the LAS beam above the ground, also known as the effective height. Because the flux is almost linearly related to the height it is important to determine the effective height as accurate as possible (see Appendix F of the LAS manual). Over flat terrain it is relative easy to determine the LAS height: take the average of the height of the transmitter unit and receiver height (i.e. the height between the centre of the beam and the ground). Over non-flat terrain it is a bit more complicated, because now we also need to consider the path-weighting function of the LAS. This weighting function reveals that the centre of the LAS path contributes more to the measured Cn2 data, than near the transmitter and receiver units. This calculation is easily done by using the effective height calculator built-in to the Evation software, which takes care of the weighting function. Note: for very long path lengths (> 5km), such as when using the XLAS it is also important to consider the earth’s curvature (decreases the height in the centre of the path by approx. 2 m over a path length of 10 km. More detailed information of deriving the effective height of scintillometers over complex terrain and the effect of atmospheric stability on the effective height can be found in: Hartogensis et al., Derivation of an Effective Height for Scintillometers: La Poza Experiment in Northwest Mexico, Journal of Hydrometeorology, 2003. If I am using an external data logger which signals of the LAS do I have to measure? The LAS MkII includes an inbuilt data logger, but sometimes you may which to add the data to an existing meteorological station with its own data logger. The LAS transmitter and receiver both have multiple analogue output signals, which can be measured by most standard data loggers. These signals allow the user to monitor the internal temperature as well as some raw signals to check the performance of the electronics. In most experiments these signals don’t have to be measured. For general flux measurements two signals are important: the Cn2 signal and Demod signal. Both signals are measured at the receiver unit. The first signal, re-scaled Cn2, provides information of the turbulent intensity of the atmosphere and is used to derive the sensible heat flux (H). It’s range lies between 0 to 2.4 V for the LAS MkII (-5 and 0 Volt for the LAS150). The second signal: the demod signal is a measure of the signal strength and it’s range lies between 0 to 2 V for the LAS MkII (-2 and 0 Volt for the LAS150). The more positive (more negative for the LAS150), the more signal the receiver has. In general the signal strength depends on the distance between the transmitter and receiver and the opacity of the atmosphere. The reason it is advised to measure the demod signal is that it can help with the interpretation of the Cn2 signal. In some cases the Cn2 can be difficult to understand, e.g. during rainy and foggy periods, while the demod signal shows clearly whether or not the receiver has a signal, or some signal is lost due to the weather. Can I place the transmitter and receiver units behind glass windows? Yes, the LAS transmitter and receiver unit can be placed inside behind glass or Perspex windows, preferably at normal incidence to minimise light loss and refraction of the beam. However, it must be noted that windows absorb a fraction of the light beam (~8 to 25%) thereby limiting the maximum path length of the LAS or XLAS. What is the latest version of the software used to process fluxes from a LAS? I would like to measure the surface energy balance – what do I need? Plus two 12 VDC power supplies (CVP1 LAS MkII power supply x2), and for mounting, two tripods (heavy duty tripod package x1) or secure mounting structure, if required. The LAS MkII Evapo-Transpiration (ET) System delivers surface heat fluxes and evapo-transpiration data from a complete, easy to use, package that can be individually configured to suit the specific customer requirements. How can I calculate the Cn2 Saturation limit for my LAS MkI Scintillometer? A scintillometer measures the path weighted structure parameter of air, Cn2, using an optical transmitter and receiver. In certain cases of relatively high Cn2 values the signal can become saturated depending on the diameter of the lens, wavelength and path length. In the calculation tool below, you can calculate the saturation limit for the LAS and X-LAS scintillometer as a function of Path length. How can I determine the surface roughness length? The LAS manual shows a terrain classification for typical landscapes with corresponding surface roughness lengths. General meteorological literature can provide more detailed information of surface roughness length for specific surfaces and/or crops. The surface roughness can also be determined experimentally, using e.g. eddy-covariance stations or from wind profile measurements. I would like to measure sensible heat flux – what do I need? I would like to measure atmospheric turbulence, Cn2 – what do I need? How do I set the path length using the Potentiometer on the LAS MkI receiver? Once the LAS has been installed and properly aligned the Path Length dial knob at the receiver control panel must be set for the correct distance between the transmitter and the receiver. The Path Length dial knob has 10 turns maximum with a vernier counter and a locking mechanism. These graduations are NOT in units of distance! The precise path length must first be converted to a dial knob setting (Pot) using the following relationship for the LAS. The equations below can be used to find the correct Potentiometer setting as a function of pathlength for the LAS and X-LAS. In addition you can use the calculation tool below to calculate the correct potentiometer setting for the (X)LAS.